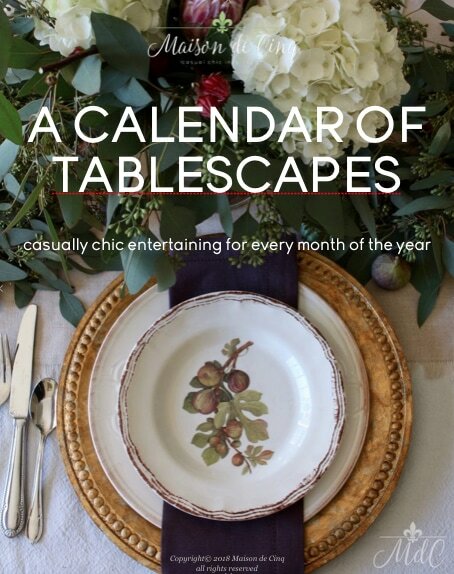 Today I’m excited to share my French Country summer home tour with you! In fact, I’m just excited about summer in general. I know when August comes and it’s blazing hot, I may regret wishing for it, but I can’t help myself. Ever since I was a kid, there has just been something special about summer to me. Swimming on a hot day. Backyard BBQs. Pool parties. Warm nights spent outside. Sandy toes and salty hair. The long, lazy days of summer remind me of a younger, simpler time, and I treasure them when they’re here. 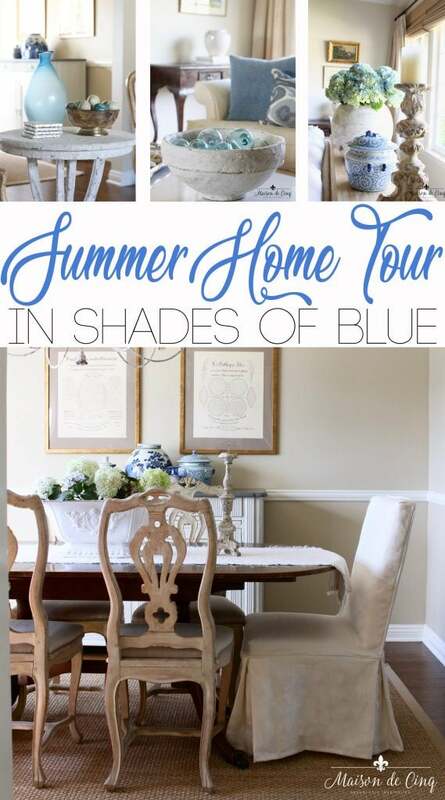 Today I’m joining my friend Jennifer’s Summer Colors Blog Tour, and I’m sharing my living and dining rooms decorated in shades of blue for the season. 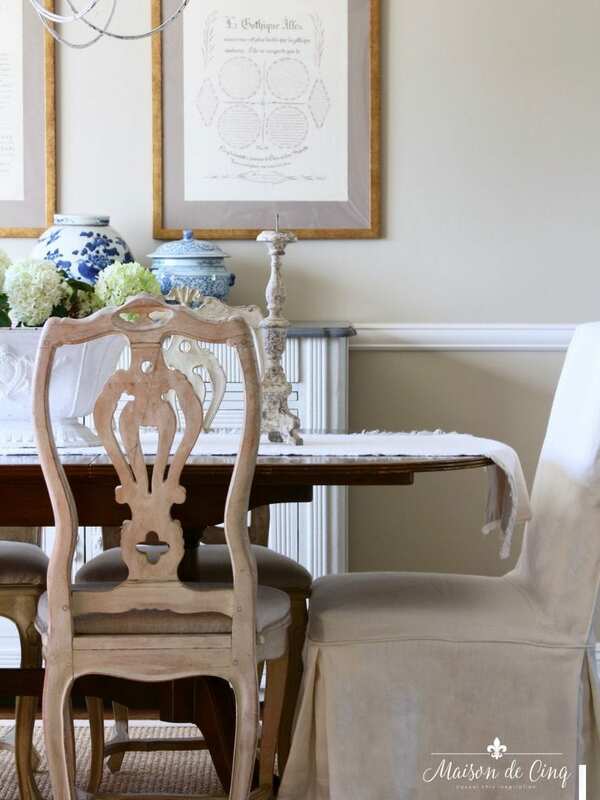 There are eight of us sharing our favorite color inspiration today, so be sure to scroll to the bottom of the post to see all the inspiration! To me, summer is all about simplicity. The same way I don’t want to overdress, I don’t want to overdecorate. Clean and simple just feels right this time of year. But I do like to add a nod to the season. Along with a feeling of coolness. And nothing feels cooler than the color blue – especially during the dog days of summer! A touch of blue definitely evokes a feeling of summer to me. Maybe the fact that blue is the color of the ocean and the sky? I’m not sure. But for me, it’s strongly associated with summer. I brought out some blue pillows from Pottery Barn that I bought last year. 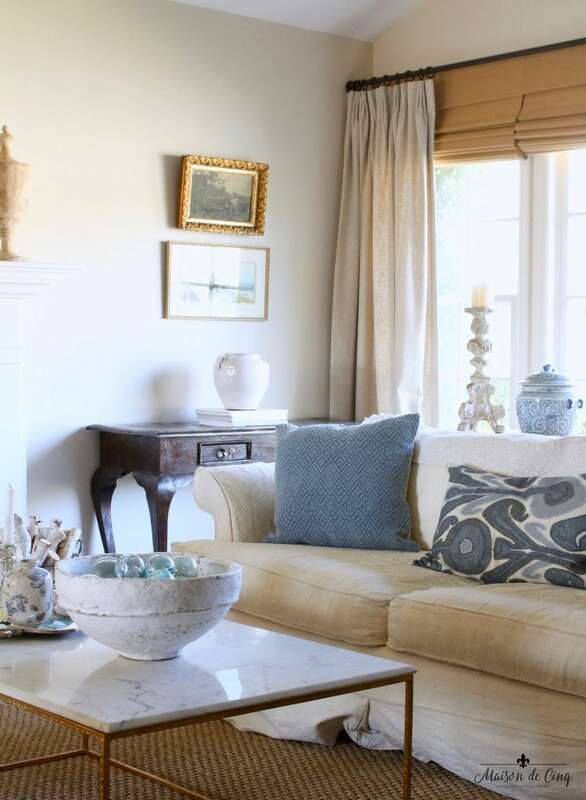 Along with my ginger jars from Wisteria, they completely change the look of the living room! My Japanese fishing floats that I used in my coastal tablescape last week have now found a home on the coffee table. I put them in this vintage papier-maché bowl and I love how the sun shines through them! Another blue vase sits on the little accent table on the other side of the room. 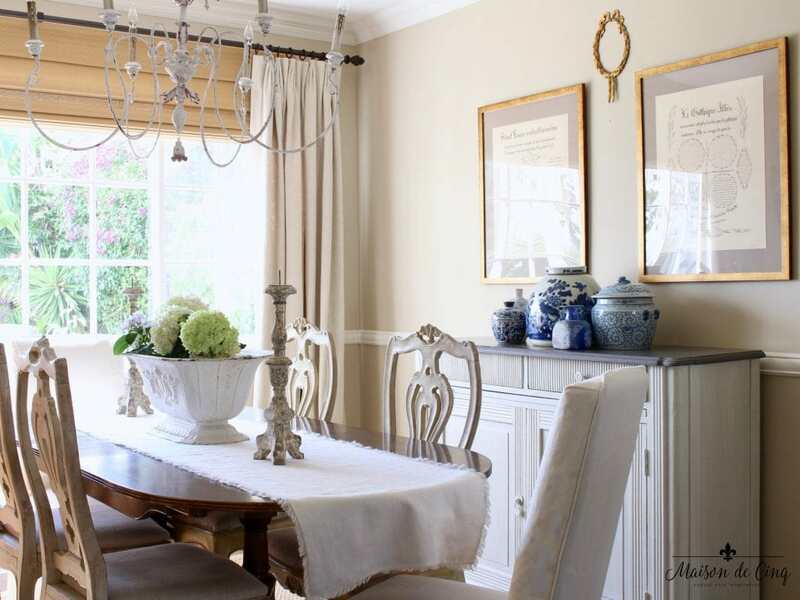 In the dining room, I grouped some blue vases along with some more ginger jars on the buffet. I have never used blue in this room before, and I’m really liking it! 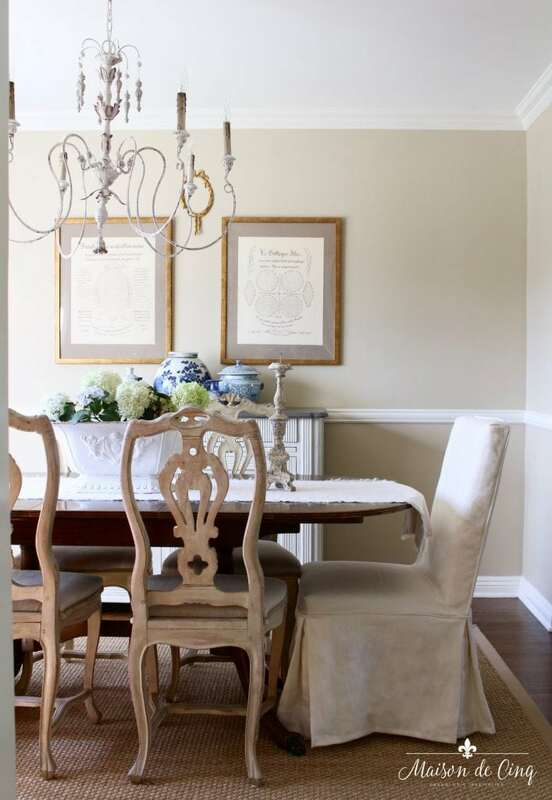 This is also the debut of my new Parsons chairs I added to the dining room! I had always planned on adding some, but just hadn’t gotten around to it, and I’m so glad I finally did. It’s given us a total of eight now which will be really helpful for dinner parties and holidays, and I love the look of mismatched chairs. 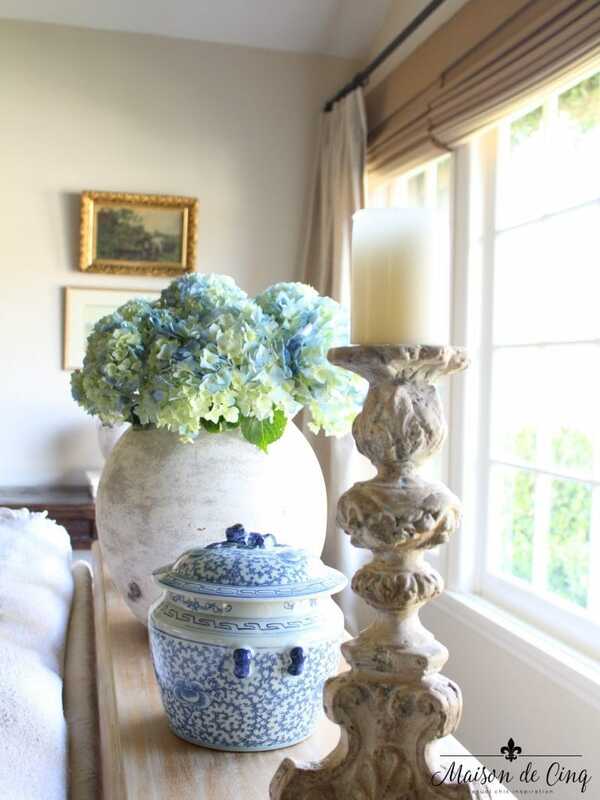 And of course, blue hydrangeas in my favorite vase add the finishing touch. I usually go for white hydrangeas, but I must admit, these have stolen my heart this season! 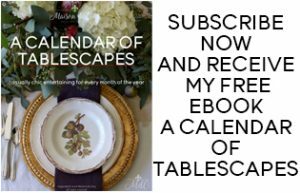 I hope you’ve enjoyed my French Country summer home tour, and I also hope you’ll head over to all the other talented bloggers sharing their color tours today. You’ll also want to check back again later this week as there are several bloggers sharing each day, with 36 bloggers sharing in all! And if you missed the earlier days this week, you can find them below…. Lovely tour! I love the blue colour and you use it so stylish! Great job! Hi Holly, and thank you so much for your lovely comment – I so appreciate it! 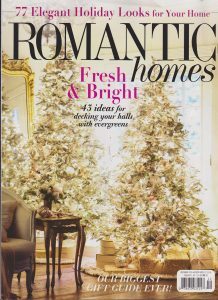 Your house looks beautiful decorated for the Summer! I love all of the blue and white! Thank you so much Angelina! 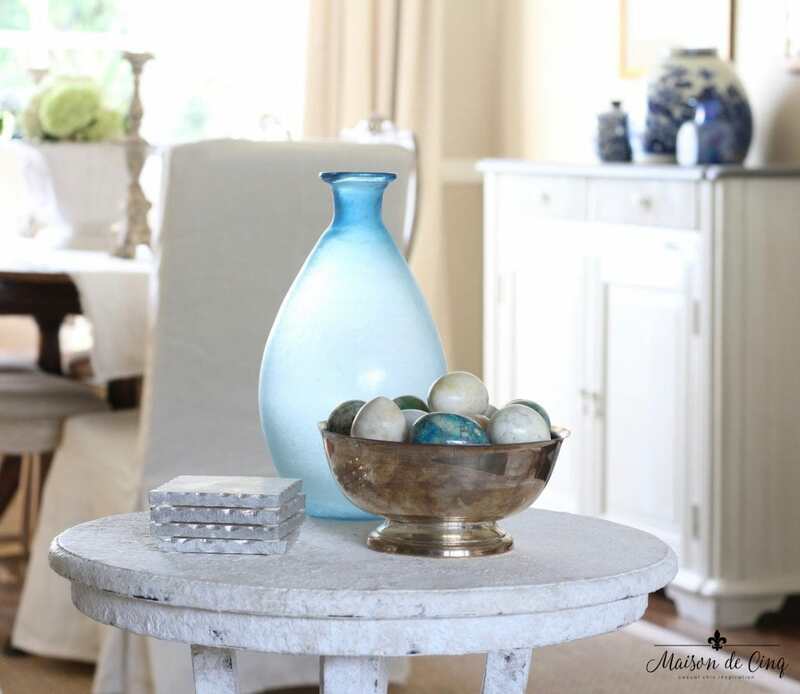 Love your side table with the blue vase on it. I also like the old bowl with the glass floats in it on the coffee table. Beautiful touches of blue. So pretty Sheila! 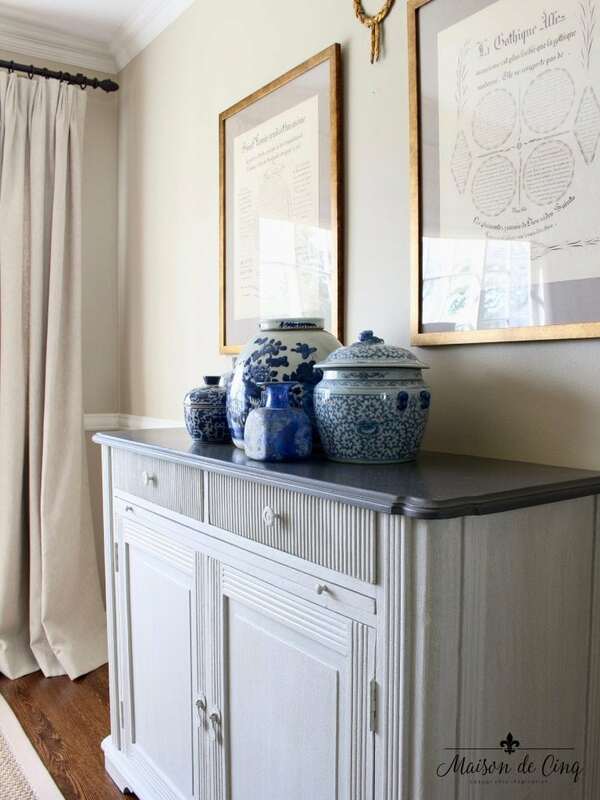 Love the blue and white on your buffet…just gorgeous! Aww, thanks so much Cindy! I so appreciate that! Pretty Sheila! You know I’m loving that bowl full of glass floats! Thanks so much for stopping by my friend! Sheila, the touches of blue are so gentle and soft! Love the hint of summer sky and ocean. It all looks so cool and welcoming!! Love it! Thanks Lory! I’m definitely a “blue convert” at this point! 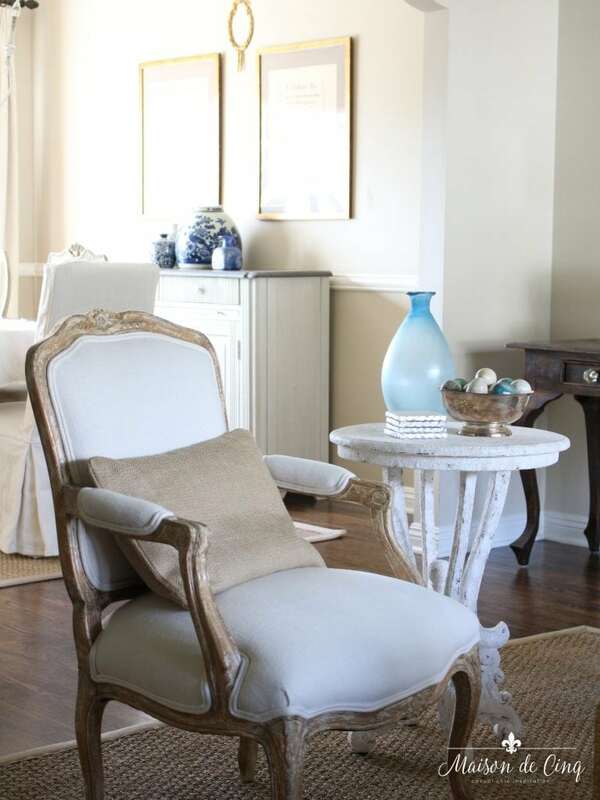 Your rooms look summer fresh, Sheila! I’m the same as you when it comes to summer. I just can’t get enough of it. The earth is so alive! 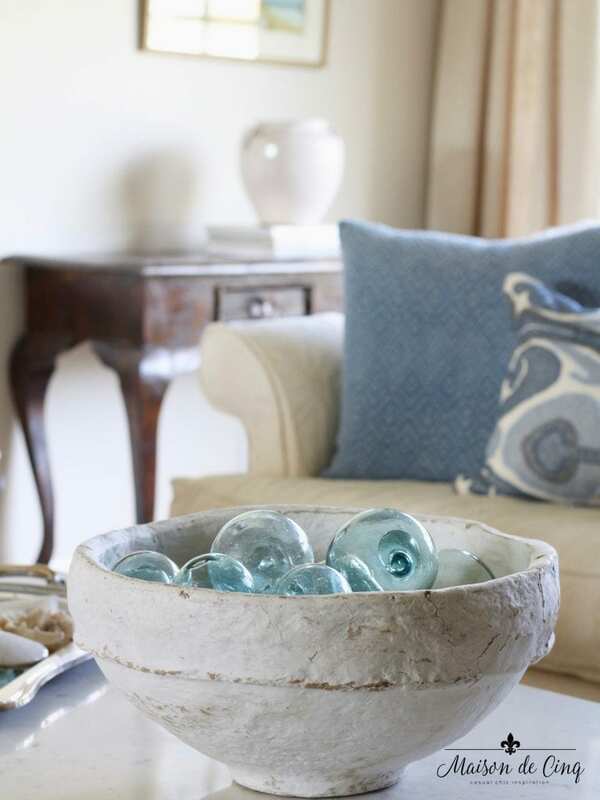 Love your touches of blue and your vintage paper mache bowl is really cool! Thanks for joining the tour this week! Thanks so much Jennifer! 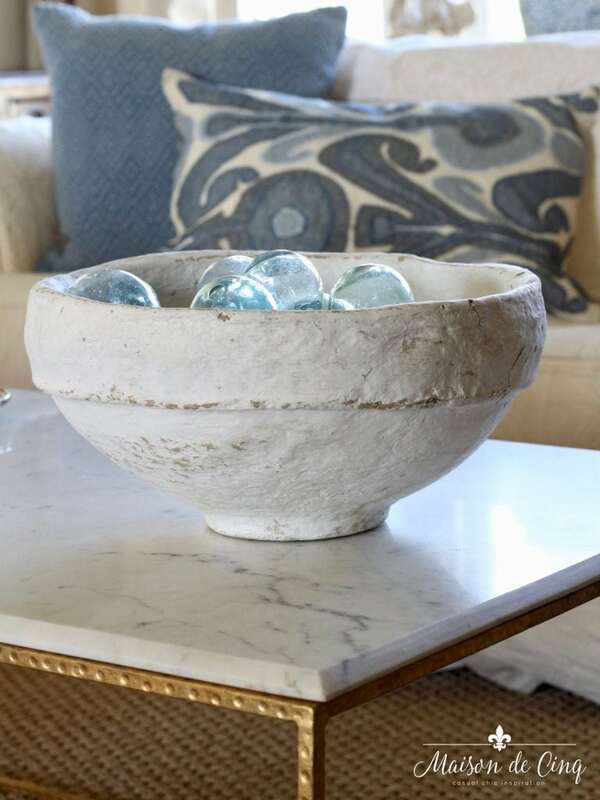 I love hearing that you like the papier-maché bowl, as it’s one of my favorite things. And thank you again for including me in the tour- what a wonderfully talented group you all are and I’m thrilled to be a part of it! loving your shades of blue. totally get me in the summer zen mode. Love the beautiful soft blues for summer, Sheila. I also love using the fishing floats in a bowl. The ones I had in a glass vase are now in a doughbowl and I need to get a few more. Thanks so much for stopping by and for your kind comment, too Kim! 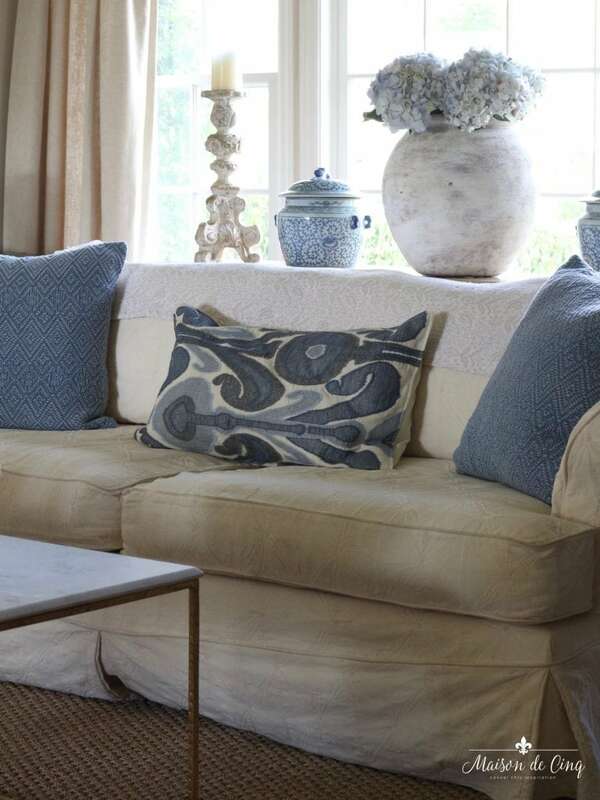 You have done such a beautiful job of working blue into your home. It does give such a summery feel and I am loving those cute floats! The new parsons chairs look great at the head of the table too! Beautiful job as always, Sheila! Thank you for stopping by sweet friend! 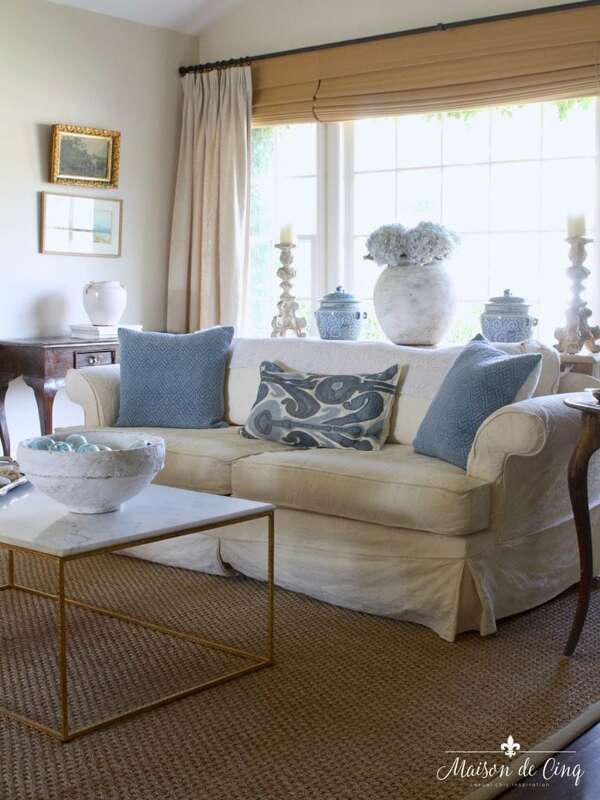 Your living room is always such a breath of fresh air Sheila….pulling at my heart strings with the blue and white. I love your Japanese fishing floats….I went to my stash room to bring the antique fishing floats that my mom gave to me and realized I had already packed them away…so I shall enjoy yours! 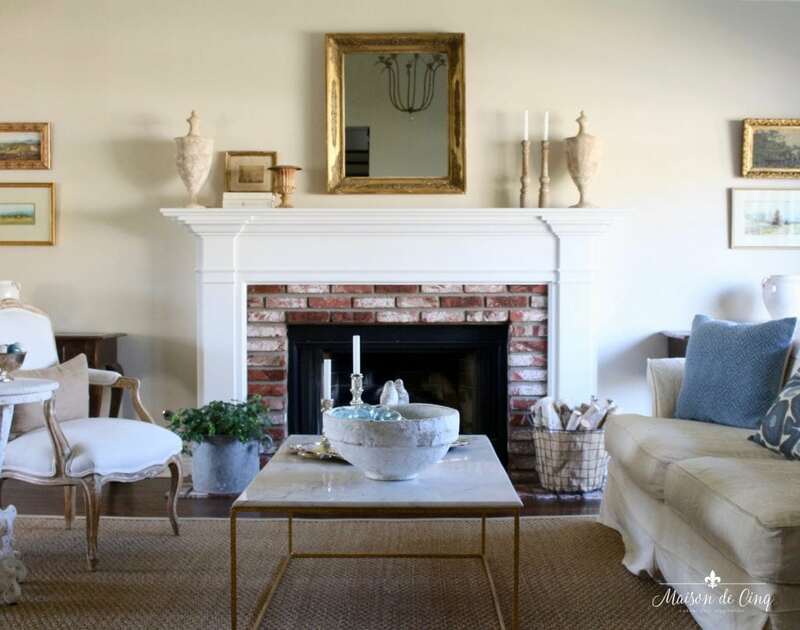 !….Beautiful room as always!!!! Happy Summer Sheila!! Aww, thank you Shirley! What a sweet thing to say! I’m in love with the floats – and I need a few more too! Happy Summer to you too!